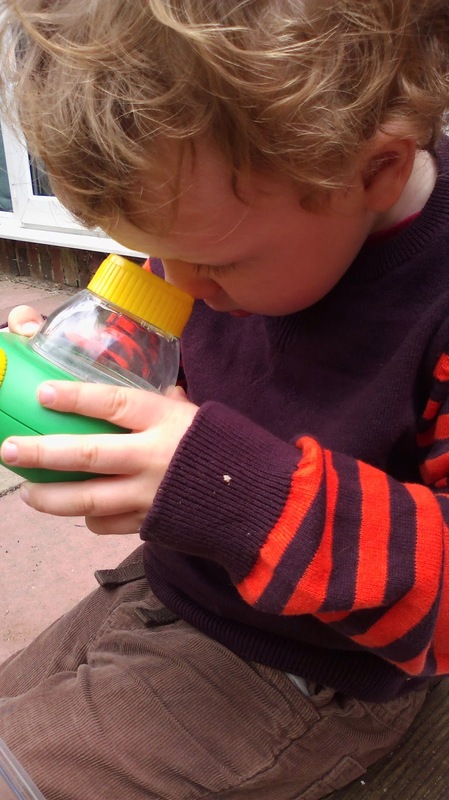 There are few activities as absorbing as bug hunting, so why not set up your own minibeast safari in your back yard or local park. I'm lucky to have a few handy bits of kit, including some bug viewers and a plastic tank, but you can make your own kit very easily by using an old clean ice cream tub to observe your finds in. You might like to use identification guides. The field studies council has some lovely fold out guides that are perfect for surviving being taken outside where books might get soggy and dog-eared. We started by talking about what we were going hunting for today while the kids got their boots on. I haven't found their appetite for bug hunting ever diminishes with repetition, but just to add an extra sense of purpose we'll pick a particular creature we especially want to find. On this day it was a millipede, so we talked about where we might find millipedes - what kind of habitat they might like and what they eat. 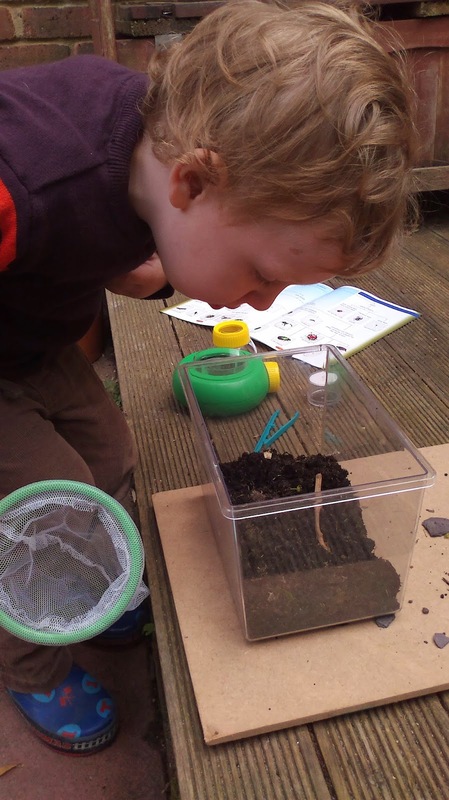 Millipedes are herbivorous and well adapted to wriggling down into the soil to get to roots and decaying leaves, so we decided to dig around the plants for them and look under rocks and pots. We looked in a book to see what they looked like, and how they are different to a centipede. Moving the plant pots around we mostly found woodlice and worms, to Toby's great delight. I reminded the boys that these creatures like to be cool and damp so our hands can hurt them, so we gently transferred our finds to a plastic tank with some damp compost in it to observe them further. Toby particularly liked watching the big pill bug type woodlice roll up into a ball and I talked to the boys about why the bugs did this. Ollie couldn't quite grasp that this might protect them from predators because, in his words 'we could just swallow them whole'. We talked about it until he decided it might help if it was a very tiny thing trying to eat them. We did eventually find a millipede, but it was so tiny I'm not sure it was much use for the boys to see very clearly what they look like. Hopefully we'll have better luck another day, although we never get particularly big ones here. After we had a good hunt round the garden we went inside and did a thorough hand wash - Ollie discovered how difficult it is to wash off slug slime. Then we sat down with a tray to look at our finds in a bit more detail. I keep this part fairly quick as we don't want to cause discomfort to the animals. We decided to look at a snail and a woodlouse as these look very different from each other. 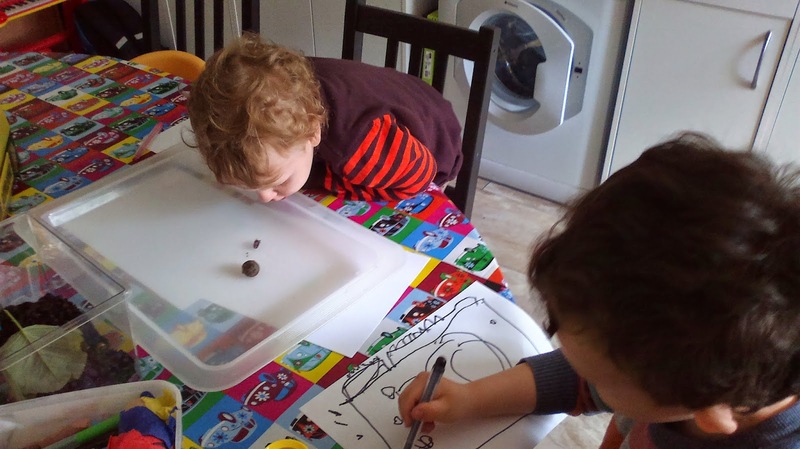 In the boy's first pictures they each drew the snail and the woodlouse. Ollie was a bit worried he couldn't draw 14 legs, but was pleased with his squiggly legs in the end. This time the only thing I prompted Ollie to add was the segments on its body, but other times the conversation might go like this - 'first draw a long rounded body, now he needs some legs, look at him, does he have any antennae? Great, lets draw those on - do you think the antennae are on his head or his bottom? Why? What are they for...' until your little one is happy with their picture. You may want to label the parts with them. Guiding what to look for is helpful and helps to build the vocabulary that your kids will want so they can describe to you what they're looking at, but after we've produced one guided picture I take a more hands-off approach and see what the boys want to draw next. Ollie decided to draw the plastic tank, including leaves for 'homes for the animals'. 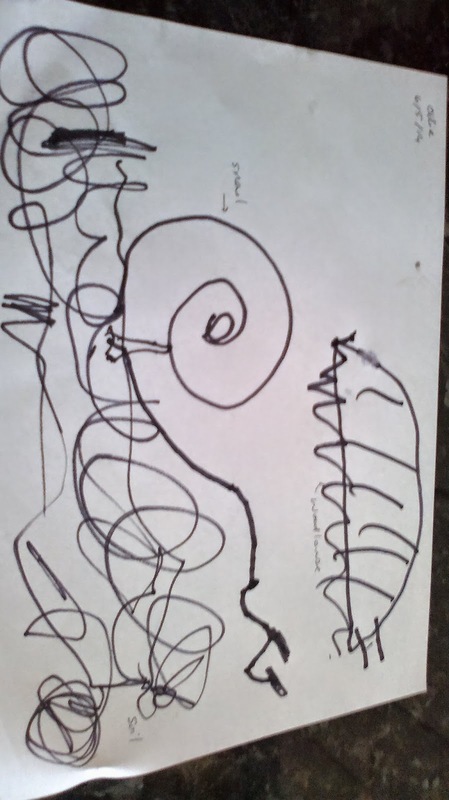 Toby made one lovely drawing of a snail while saying 'round a round a round a round' and also a woodlouse that surprising looks quite like a woodlouse. Ollie's first picture is here on the blog. Safety bit: as I've mentioned on previous similar posts, check your local guidelines for whether you have any hazardous creatures living in your local area if you are outside the UK - in our garden we might get a nip from a centipede or a sting from a bee, but most of our wildlife is pretty harmless. I encourage the kids to only pick up familiar things that they have held before such as snails and to check with me before they handle anything unfamiliar. Hand washing is really important too. Soap and water is best, but I carry a hand sanitizer liquid for when we're exploring away from home.